I wonder who these anonymous "US officials" could possibly be? 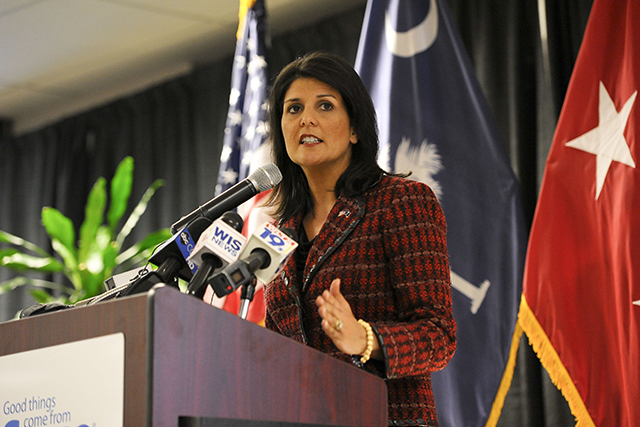 It sure is amazing how psychic Nikki Haley predicted Assad would carry out such an attack last week! Was she one of these anonymous "US officials"? Michael Caputo seemed to have implied just yesterday to CNN that Haley was behind the anonymous NYT op-ed. Former Trump Aide Michael Caputo says he has figured out who the op-ed writer is, but won't say who. As Caputo said, the anonymous op-ed writer has been diabolically "gaslighting the President" and "plotting against him." She thinks "she should be the president instead of Donald Trump," Caputo said. Note too, just four days ago Secretary of State Mike Pompeo's "US Special Representative for Syria Engagement" Jim Jeffrey, who was appointed just weeks ago on August 17, made the rounds claiming he's "confident" that President Trump's "on board" with staying in Syria indefinitely. Jeffrey also claimed, without providing any evidence, that Syrian President Bashar al-Assad is about to carry out a chemical weapons attack in Idlib. "There is lots of evidence that chemical weapons are being prepared," Jim Jeffrey said during his very first interview with a "few" reporters. "I am very sure that we have very, very good grounds to be making these warnings." Of course, we will get to see none of this evidence before such an attack takes place and six months later it will come out it was all a fraud!